Are you a Listening and Spoken Language Specialist (LSLS) candidate planning to sit for the exam this summer? Join a virtual study session to sharpen your skills and prepare for success! 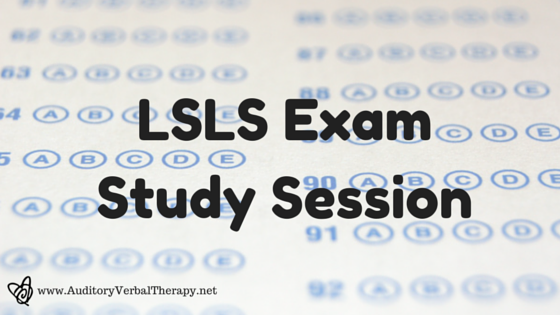 The study session will take place on Thursday May 28th at 8PM Eastern Standard Time. The cost is US$25/person. Stay tuned for information on another study session coming Fall 2015! This entry was posted in Elizabeth Rosenzweig MS CCC-SLP LSLS Cert. AVT and tagged AG Bell, Auditory Verbal Therapy, International Training and Mentoring, Professionals, Webinar. Bookmark the permalink. ← Beginning with Babies Webinar: Encore Presentation 5/18/2015!